The annual awards banquet for the Hawai’i basketball team will be held on Wednesday, April 3, at the Hilton Hawaiian Village Tapa Ballroom. No host cocktails will begin at 5:30 p.m. with dinner and the evening’s program to follow around 6:30 p.m.
Tickets are $120 each, while tables are also available for purchase. Order forms may be returned to the UH basketball office. For best seating, return the form by March 27. For more information, contact Bobbie Omoto at 956-6501. The Warriors completed their season this week with a 69-65 loss to Air Force in the first round of the CollegeInsider.com Postseason Tournament. It was the second time in the past three seasons that the Warriors participated in the CIT. Hawai’i completed the 2012-13 season with a 17-15 overall record, including 10-8 in its first season in the Big West Conference. Among the awards to be announced at the banquet are Most Outstanding Player, Most Inspirational Player, Best Defensive Player, and Academic Award. 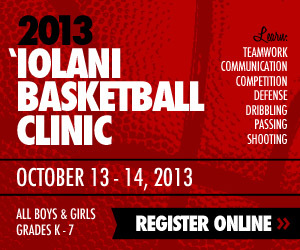 Mahalo for your contributions to the program. I hope all of you enjoyed your stay in Hawaii. Remember to keep up your studies and continue to work on your game. Stay determined. Stay hungry. Be a contender next year in the Big West. I know who’s not winning Most Inspirational. I see Warrior Insider is taking the high road by not mentioning the Vander debacle. UH will be one of the front runners in the Big West next season. I don’t see any way possible that the team won’t be better next year. Fotu is a more dynamic player than Vander as a freshmen, and makes decisions/process information way faster than Vander could. The offense often bogged down when Vander had the ball at the post because he took so long to do anything. The Big West’s representative in the NCAA (Pacific) is losing handily to Miami right now… 40-16 in the 1st half. Long Beach St was completely embarrassed by Baylor in the NIT. The Beach lost 66-112!!!!!!!!!!!!!!!!!!!! Baylor is just a terrible matchup for The Beach because The Beach relies on it’s athletes to penetrate and attack the paint. The problem is that Baylor has far superior athletes. OUCH. When its athletes vs athletes… the better athletes will win. I agree DK and eagle, credit to the high character hard working on the court and off UH Warriors. Gib announce how you will upgrade with shooters and athletes, let Ben and we fans have a good indication. Usually that information comes out at the Awards Banquet, either, who is coming, staying or going. Wish the best to TEAM. Yes totally convinced that Christian and Isaac, will be a FORCE in any conference UH is in. Big West , MWC or PAC 12. If Gib can bring in, a few more, if open scholarships available, we shall see, athletic scorers, who can create, get to the rim, defend with quickness and smarts, UH will be from day one, a very, very good Basketball team. We shall see as early as this spring, when by NCAA rules, MBB team can have light individual workouts. And in 2nd summer session, if new guys get in, we will see what additional parts Gib has to make year Four Fantastic. I think he and returnees plus whatever LOI guys coming in will be exciting, a faster more athletic and unselfish TEAM!! And thanks a million Dayton and WI , Valerie Schmidt, and son, Ameriprise, and all supporters of this awesome site. This is a great recruiting tool as well. Without question current and potential future MBB players read our posts, so we be real, objective, not abusive yet honest. We want all the good student athletes who want to be part of a potential Great Team over next few years, to come to Hawaii. The fans will welcome you with open arms. Coach is new, however , now going on 4 years, ..I think that is what Gib first said initially, when hired, we would have to be patient..takes time to get the type of athlete, now he knows, good character, plus athletic, quick TEAM players. Go Warriors and Mahalo to all the fellow Fans and families, Tonganator, Ozi and Aussie Mums, Memphis Mom and Brereton Ohana, and all the Warrior MBB Nation. Shall be supporting MBB off season and look forward to NCAA summer leauge and the workouts with new players! Pretty exciting stuff. Look forward to both Aaron and Michael Thomas joining Team next year! Mahalo to the patience of Aaron Valdes and family! Michigan and Michigan St play in Auburn Hills, MI? Kansas and Kansas St playing in Kansas City, MO? Cal playing in San Jose, CA? Louisville playing in Lexington, KY? Ohio St in Dayton, OH? I don’t care if a #1 or #2 plays close to home, I think it’s a deserved privilege. The NCAA says it wants neutrality when they clearly don’t set it up that way. Just say the top seeds will get favorable tourney sites and nobody will complain. Speaking of conspiracy theories, the NCAA always seem to stick it to UNLV. #5 UNLV played a virtual away game vs #12 Cal in San Jose… Not to mention these teams played this year already. Yes, Cal shouldn’t have been a #12, but the NCAA made up for the bad seeding by sending them to San Jose. And I’m officially rooting for complete chaos. My bracket is already in flames with New Mexico losing. I’m not sold that Gib Arnold is a top tier college basketball coach. Yet. I think Ben Jay has a tough decision and I hope his decision will be correct and I will support that decision. We’ll see. Uhfanzonly1 – Best and Fairest – Top player of the season by far, but injuries prevented full participation. He followed the coaches advice and did his rehab – eating, exercising and healthy living – a comeback late in the season consolidated his position as best and fairest. Former UH Athlete – Best analyst – This player is a bit of a “dark horse” when it comes to understanding how he does what he does best – analysis – we are all guessing that he is a former basketballer and not chess player – but either way – he can powerfully integrate statistics and strategy such that we all benefit from his analysis – we are all sure of one thing – Gib probably reads Warrior Insider for the insights that this punter gives him. Eagle – Best team player – its all good for this player – any situation can be put into a musical and poetic style – this adds balance to the team and he is real pleasure to play with. Derek – Most consistent performer – this player is always there, solid performer – accurate, passionate, balanced and very very thorough. Acknowledgments to the company – CEO – Dayton, Deputy CEO – Wes, Company Directors – The Schmidts. Words are difficult to find to express our gratitude for this site, so many people watching. participating and enjoying. This site has brought joy to all UHMBB fans and families and friends worldwide! Player to watch for next year – Playhoopsa – young and fresh – his eagerness is delightful and we have big hopes for this player next year – he has shown good form this year. What a season! Don’t be disheartened if you didn’t get a trophy this year – everyone’s has contributed and is valued in this team. Aussie Mum 😀 Awesome Analysis of contributors, and keeping it concise and real! I am so happy that Michael got inserted into game against AFA, and Michael helped team to make great comeback. And the Australian Kid, hit a rainbow 3 from the corner, Gib I heard was grinning from ear to ear. That Aussie Mum is a Final Four NCAA, all star team! Glad that we , from the Northern Hemisphere, could bring a little joy to that Continent, Australia, the land down under! Dayton, the ALL WORLD member of Warrior MBB! Hands down!! Along with, All Solar system team, Wes, Ameriprise, Valerie Schmidt and great number one UH MBB fan, her son! As well as Schmidt Ohana, and other supporters , donation wise, known and anoymous. Go Warriors, and , you make are hearts glad, in this crazy world of 2013! Aussie Mum is Awesome, and Michael is fortunate to have a great family supporting him. Michael, has his own fan club. He is a good looking guy, with great heart and desire, he is what UH MBB Warrior spirit and program should be and hopefully will be in the next 3 or 4 years. I am getting goose/chicken skin, maybe need a Vegemite Sandwich or a Tim Tam! Keep the flame burning Aussie Mum, great contribution and glad you got to see Michael in person at the Diamond Head Classic.! Darn, older age and homebound, however, now I can type and post again, even if cannot get out, that is why I blog away. Have a great summer or WINTER! Aussie Mum, and thanks for support and kindness! Next year, MBB will kick Ar..e! I know there are excellent basketball players in Australia, New Zealand, Canada, countries in Africa, and Argentina/Brazil, and Europe. It’s a matter of finding the talent. Hawaii is a melting pot. I’d take a Savovic type any day. Heck, I’d take a Shimonovich type too, or Burneika, or, Puida. Need badly a high scoring point guard. Like I said Derek – Most consistent performer!!!!! You put a big smile on my face – it is a joy to read your posts – well deserved Best and Fairest!!! Aussie mum, that was awesome. Does anyone know if coach Gib recruits in Asia, most notably the Philippines. Not being biased or anything (I’m Filipino, go Christian!) but if there is one thing I know about bball, point guard play in the PI is pretty damn good. They have creativity, vision, passing ability, aggressive, no fear and can shoot the rock. I’m mentioning this because we can’t seem to get a supreme PG. Jace (along w/ the “Deserter”) bogged down the O for many reasons listed on this warriorinsider.com. Coach if you do check this site, consider visiting the Philippines, and eat some sisig there while you’re at it. Go Warriors! One last thing, can we have articles about the Wahine bball team as well on warriorinsider.com? Or will the site have to change its name? One last thing, can we have articles about the Wahine bball team as well on warriorinsider.com? Or will the site have to change its name? (Don’t do that , i like warriors instead of rainbows). The ladies deserve some love too. Lots of things happening shortly, staff will be at final four , coaches will be intermingling, who knows , besides players coming in , leaving, staff may change? jeff and dawheeler? Is that Portnoy and Jackson? If so welcome to the site! WHO Might Not get a Scholarship OR Coaching Extension? “Couldnʻt” have really expected any freshman (other than Fotu) to be an immediate “impact” player? BUT Could be Tracking Versus their “Expected Improvement Curve”? And What of the Low-Minutes Junior(s)? Ben Jay welcome to the wild wild west UCLA coach got canned USC still open Jamie Dixon got 10 more years Gib should have signed the 5 year one he chose not to UH is in no position to buy him out so extend him ? At a lot of places, winning is not good enough, especially when the goal is to win a national championship. The expectations at UCLA is too hard. Nobody can be like the Wizard of Westwood. For all the major conferences, they are not long for patience. It’s either win big or get fired. Example, Gene Chizik from Auburn. Riley Wallace coached for 20 years at UH. I don’t think he was an instant success when he first got the job. It takes time and a few lucky charms to come up with a winner. Hawaii is not known as a basketball powerhouse. Consequently it takes time to become a winner. But I will stick with Gib Arnold. He has passion for the game and an excellent recruiter, and one day he is going to strike it big. I hope it will be with Hawaii. I used to play chess. Derek, Gib is not a top tier X’s & O’s or stratagist yet. He has improved quite a bit and he got as much milage out of Vander as anybody could with Vander’s volitle attitude. I do think Gib is a top tier recruiter which is 1/2 of what it takes to be a top tier coach. College coaches have very tough jobs because they have to recruit well and be good at X’s & O’s and be teachers. Hawaii coaches are at a greater disadvantage because of school location, budget issues, and conference affiliation. Gib is still in the “up & coming” coach category as he only just finished his 3rd season as a Head Coach. I know some people are banging into Gib already but none of the complainers have given a realistic option that’s better that’s within UH’s budget. Also, Gib is getting paid peanuts. People argue that his performance doesnt match his salary as kne of the highest paid Big West coaches… but remember the other Big West schools play FBS football, so their general athletic budgets are small. People don’t realize how amazing his recruiting efforts have been after taking over a complete dumpster fire that Bob Nash set ablaze. UH tried the latter and it was a complete and utter train wreck that UH is just recovering from. I’d rather not see a journeyman retread head coach, so that leaves the young unproven coach as the best option of the 3. Mike White was a name that popped up during the year as he has La Tech turned around in 2 years and the Gib critics are using that as fodder against Gib. 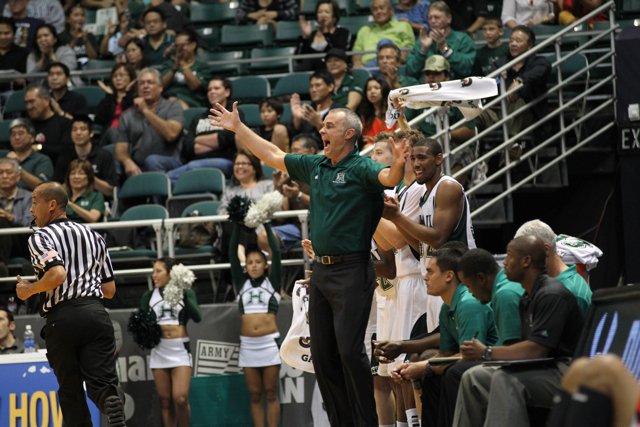 1st, Mike White wasn’t on the radar when UH was searching for Nash’s replacement. White was an asst at Ole Miss, which isn’t a name BB program, plus being so far from away, nobody in Hawaii watches SEC basketball, (why would you?) so UH would have never discovered him anyway. White has zero ties to Hawaii that I know of, so The only way Mike White would have made it to Hawaii is if he literally knocked on the door. 2nd, La Tech’s gaudy record was a farce because their schedule strength was a joke. The WAC probably had its worst lineup of BB teams in their history this year. Not only that, La Gech folded like a cheap tent at the end of the season when they lost their last two WAC games and then losing in the 1st rd of the WAC tourney. If La Tech played UH’s non-conference schedule, La Tech would have over 10 losses. Mike White is a very good coach but his record this year isn’t what it seems. It’s pretty clear that you will defend the job Gib did this year all costs. And I know you’re still going against me about Michael White. Instead of drafting up a rebuttal, I’ll just post what I did on the Big West board. FYI, I defended Gib for the most of year on the Big West boards where he was getting ripped. Some people are rating him the worst in-game coach in the entire conference. ” I have to admit that I was wrong about the job Gib had done this year. It was arguably his worst season as our coach. It was evident that he did not manage lineups and personnel very well. It’s rather unusual to play an oversized point guard, a slow small forward, two power forwards, and a center together and expect to be able to guard anyone. He also was unable to keep Vander’s emotions in check, which turned out to be the story of the season. With that said, I still don’t think Gib is that bad of a coach as some people here are saying. He had only three returning players on the roster when he took over the program. He essentially had to recruit nine new players. He had to take a chance on guys with questionable characteristics to get the job done. It was rather an insurmountable feat that he had put a team together (in the spring period) and won 19 games in his first year (including 9 of his last 12). Athlon sports called it a “minor miracle.” He has solid wins under his belt (Xavier, Clemson, Mississippi St.), but he just needs to turn the corner. Unfortunately, I’m not sure he’ll get the chance to with the conference being even stronger next year.